With a sumptuous design inspired by a custom yacht from 1939, the Skyacht One is one of the most luxurious private jets in the world. At £53m ($83m), SottoStudios’ Skyacht One combines the experience of a luxury superyacht with the avant-garde Embraer Lineage 1000E private jet. 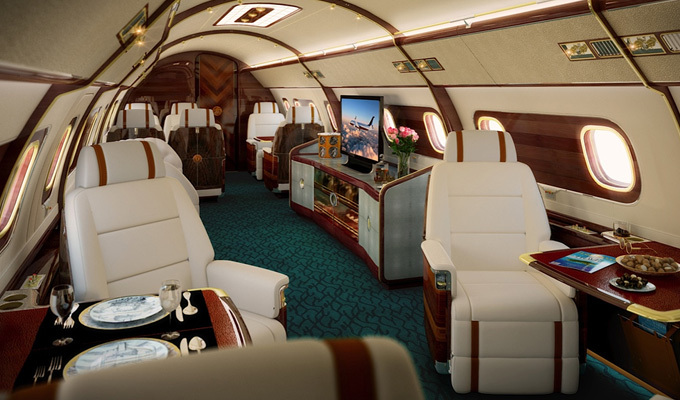 Created from a unique collaboration between the world famous experiential designer Eddie Sotto and Embraer Executive Jets, Skyacht One is an exclusive and luxurious customized version of the Lineage 1000E flagship. 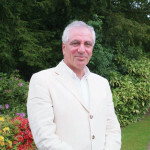 Formerly Senior Vice President of Concept Design for Walt Disney Imagineering, Eddie is an internationally recognised experimental designer with over 30 years experience. He was named one of the thousand most creative people in America in the book 1000: Richard Saul Wurman's Who's Really Who by TED founder Richard Saul Wurman. Eddie's portfolio includes his current role SottoStudios Incorporated as President, his work at Disney, "E-Ticket" Attractions and retail, restaurants, web and mobile technology, including digital architecture like ABC Times Square Studios. His latest project has seen him take inspiration from the historic Thunderbird wooden yacht. 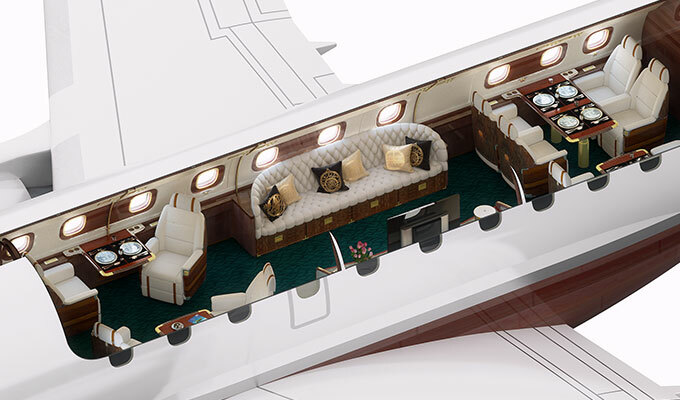 The luxurious sky vessel includes a conference room with engraved brass, gold, silver, and platinum accents as well as leather sunshades, a cocktail bar and a master suite with its own bathroom and walk-in shower. 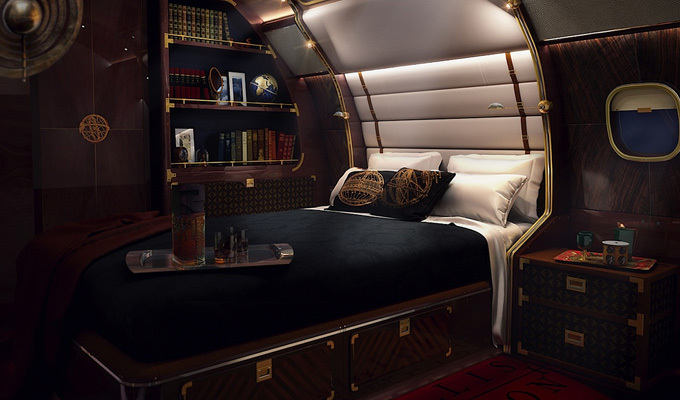 The mile-high master bedroom possesses full length mirrors, an in-flight phone and a 23in LCD display TV. 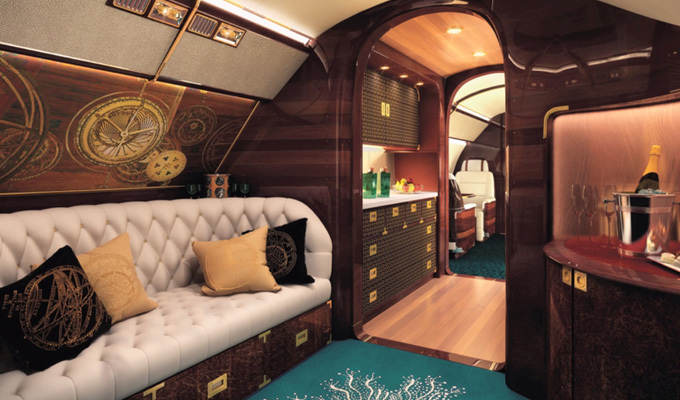 The concept plane boasts five opulent rooms which include a chartroom that incorporates marquetry artwork embedded with a planetary clock and a conference room. The nautically inspired skylights that run through the length of the aircraft boast intelligent mood lighting that samples the outside view and adjusts colour to colour to compliment the time of day. It affords its owner a chance to express his or her individuality and taste with opportunities to personalise the superyatch jet further. [caption id="attachment_40802" align="aligncenter" width="680"] Upon entry, passengers are greeted by the StarClock inspired by Arabic sextant and adorned with marquetry. The main cabin is expansive with a Chesterfield Sofa and Cocktail Bar with a TV and a large luxurious sofa. [caption id="attachment_40803" align="alignnone" width="680"] The master suite is intimate and sensuous with a queen-size bed lined in padded suede, and fitted with reading lights that adjust up and down the ship's trusses, while a flat screen TV faces opposite. [caption id="attachment_40804" align="alignnone" width="680"] The Skyacht one has five cabin zones with a TV, cocktail bar and lavish seating with enchased panelling and window "portholes" lined in brass, nickel and mahogany. [caption id="attachment_40805" align="alignnone" width="680"] The 84-ft-long yacht jet has a fine dining space, a conference room, chartroom and relaxing 'galley' lounge area with cocktail bar and large sofa.